It may seem an exaggeration to describe British supermarket chain Tesco as ‘struggling’ as they announce underlying profits of £354m for the first half of the financial year, but considering that figure was £779m for the same period in 2014, the firm has seen a 55% decrease in profitability. The pre-tax profit figure tells a healthier story at £74m, compared with a £19m loss for the same period in 2014. Meanwhile like-for-like sales have dropped 1.1% in the UK, but overall sales volume has risen 1.4% and the total number of transactions at Tesco in the first half of its financial year are also up 1.5%. So what does all this really mean? The answer is somewhat complex, but the Tesco chief executive Dave Lewis who arrived from Unilever just over a year ago is rebuilding the company after they announced the worst results in their history in April. Those results showed a record pre-tax loss for the financial year to the end of February of £6.4bn. Lewis has adopted a strategy of putting pressure on profits in the short term by introducing widespread price cuts and increasing the number of staff on the shop floor, to attempt to attract customers back. 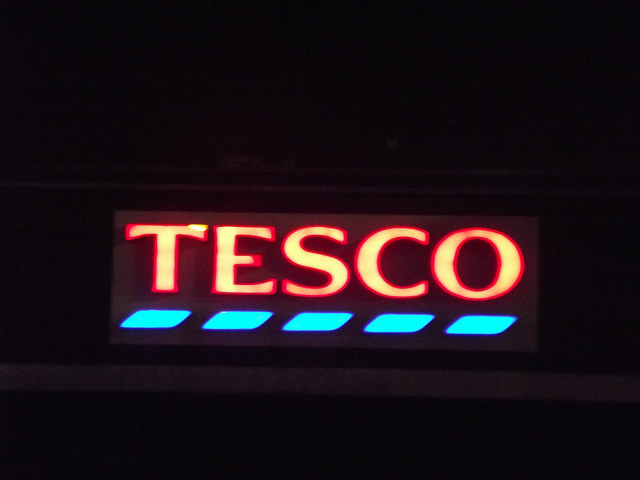 Tesco have sold their South Korean Homeplus stores and reduced their overall debt by £4.2 billion in the process, but they have also confirmed that to meet the UK government’s potential National Living Wage of £9 an hour for workers by 2020 it will cost them about £500m. Tesco’s announcement of poor results come shortly after competitor Sainsbury’s predicted rosier than anticipated full year profits. The UK supermarket scene is an ultra competitive landscape. In relative terms sales are still dominated by the big four supermarkets Asda, Morrisons, Sainsbury’s, Tesco, who had a combined market share of 73.2% of the UK grocery sector in the quarter ending 4th January 2015. That is a small decrease from 74.1% in 2007, but the ‘big four’ are coming under increasing pressure from discount retailers such as Aldi and Lidl. Tesco plan to strike back with additional price cuts, after this week’s announcement of their underlying profits essentially dropping by more than half in the first six months of the financial year.